Stitch dictionaries are inspiring reference books with endless variations of knit and purl stitches that produce the fabrics of all knitting. 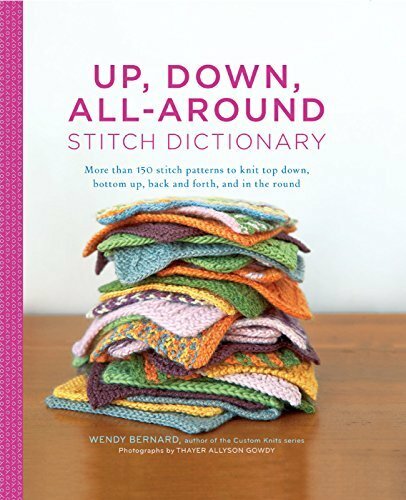 But in the Up, Down, All-Around Stitch Dictionary, designer Wendy Bernard presents instructions for working 150 popular stitch patterns four different ways: top down, bottom up, back and forth, and in the round. This hefty collection, ranging from lace and cables to colorwork and fancy edgings, is loaded with beautifully photographed swatches of each pattern, plus charted and text instructions, as well as some patterns. This is an invaluable go-to resource, sure to inspire legions of knitters to use stitch patterns in new and exciting ways.